Sandy Bells’ (Forest Road, Edinburgh) is a pub where traditional music happens regularly. Away from the fast tunes and craic at the back of the room, there is often serious discussion, sharing and knowledge exchange (as well as flyting and debate) to be found among close-knit groups gathered closer to the bar. Catching up there with my old pal Jim Gilchrist this Friday, I was d elighted and astounded to find him produce, from a plastic bag, an old, original copy of a Scottish fiddlers’ manuscript tune book. Written in various hands it appears to represent a good sample of the popular fiddle music of the early twentieth century in a place, as yet, not known but certainly in Southern Scotland. Any old tune book is of significance as it brings insights into not just repertory but also of popular taste, creativity and musical interests. Manuscript tune books are highly important. Many, like this one, contain popular tunes taken down from printed collections, but also contain unique material that never found its way into commercially produced anthologies. I look forward to playing the tunes and to writing about the collection here in detail in due course. A number of references to Gow portraits can be gleaned from the pages of the Scotsman. On Saturday May 5 1877, Chapman’s Auction Rooms, 11 Hanover Street, Edinburgh held a sale of ‘Pictures of the Highest Class’ including a ‘Portrait of Niel Gow by Sir Henry Raeburn, R.A.’ (4 May 1877, p. 8). This blog, and my current work on the clarsach movement, is increasingly reinforcing my view that the term ‘revival’ has only limited value in discussing many aspects of Scottish traditional music. Looking back before the 1960s and 70s it is clear that there were successive and overlapping waves of neglect and rediscovery of the musical heritage. There were each different from each other in terms of key actors, their contexts, ideological motivations, behaviour and, ultimately, musical outputs. Revival is not a modern theme but one which is fundamentally built in to the whole issue of transmission. There have been waves and more waves will follow. There have been many similarities and shared threads too. Looking back we can see the early roots and try-outs of many ongoing initiatives. The cult of Niel Gow, initiated by aristocracy, developed commercially by his own family and rekindled in the nineteenth century rose again in the mid-twentieth century. This was marked by the high-profile unveiling of a memorial to the fiddle in April 1949 (expect more on this later) and a proposal to link the memory of this rustic, country fiddler to the artistic and technical development of strings playing in Scotland through the education system at different levels. It is hoped to provide a living memorial to the Gow family by the publication in convenient form of some of the compositions; other ideas put forward and under consideration are the provision of prizes for young music students in schools, prizes for annual competition at music festivals, and, if sufficient funds van be collected, one or more scholarships for music students. The Executive Committee, therefore, welcome the recent formation in Dunfermline of a committee to raise a fund for the endowing of an open scholarship in string playing at the Scottish National Academy of Music in memory of Niel Gow, the famous Scottish composer. The sum aimed at is £6000 and it is hoped to arrange for the publication of some of Gow’s best works in a form that will make them available to the younger generation of Scots. I wonder, did this initiative progress? Further research is required. Perhaps the experts at the Royal Conservatoire of Scotland, where it is now possible to graduate in Scottish music through fiddle playing, can shed some light. This Niel Gow is from a Victorian picture postcard published by Valentine of Dundee. Could this have been made from a photograph of one of the missing oil paintings we now know were once extant? This sculpture of Niel Gow, Robert Burns and Mrs Gow was made by the sculptor William Anderson of Perth. Where is it now?, I wonder. This may be his sculpture ‘Niel Gow’ that was exhibited at the Royal Scottish Aacdemy Exhibition in 1858 but has not been traced. The son of David Anderson, he continued the family business at County Place, Perth after his father’s death in 1847. He showed a figure of a Highlander throwing the putting-stone with reliefs illustrating highland games on the pedestal at the Great Exhibition of 1851. In the same year he went into partnership with Alexander Christie. He received his first important commission, for a bust of Robert Peel for the Peel Memorial in Forfar, in 1852. A review of the work in the Illustrated London News described Anderson as a young sculptor of promise and noted that he had executed the bust for a nominal fee (ILN, 21 May 1853, 397). The Forfar memorial is reputed to be the first permanent memorial to Peel erected in Scotland. In 1854 Anderson executed a heroic statue of Burns, which he presented to his native town. It was described by the Builder as ‘of manly make’ and ‘enveloped in the homely folds of a Scottish plaid’ (Builder, 1854, 295). The sculptor died at Perth in 1867. The engraving, featured in the Illustrated London News (January 20 1859, p.116) was based on a photograph of the group by Mr Thomson of Perth who, it was reported, had also made a stereograph from it. Wouldn’t it be nice to learn that a copy had survived and that we might view it in Victorian 3D? The annual Niel Gow Festival is almost upon us and I hear that the organisers aspire to commissioning a sculpture of old Niel. I wonder if it will turn out as fine as this ensemble. Peter Milne (1824-1908), Scottish fiddler and opium addict, is reported to have once said: I’m that fond o’ my fiddle, I could sit in the inside o’t, an’ look oot. I wonder what the mannie would have made of these incredible images. 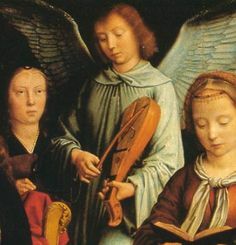 Scotland’s writers and historians of the national and traditional music have speculated on whether there was a tradition of bowed instruments before the arrival of those of the viol type leading, ultimately, to absorbtion of the violin family. Speculation has been based on a relatively small number of written sources although I’d like to think modern scholars may have added more to these. There is, therefore, suggestion of the fiddle (fedyl) and of the rebec (rybid). Names, however, are no indication of what actual instruments actually were at any time as the same name was often applied to different devices and established titles stuck, even when the instruments were greatly changed or new. There has also been speculation on bowed harps and similar instruments that may have come from Celtic or Scandinavian cultures. Collinson (plate 11) has a good photograph of a rebec player carved on the outside wall of the south transept of Melrose Abbey that he suggests is 12th century. I have yet to see this carving and to locate a recent photograph so I am not sure what condition it is currently in. Carvings of musicians exist on a number of Scotland’s monuments but many have suffered considerable deterioration in recent times. Then there is the oft-quoted and much later reference to Mary Queen of Scots being entertained in Edinburgh in 1560 by “a concert of the vilest fiddles and little rebecs, which are as bad as can be in that country” (Collinson 1966, p. 201). In terms of the pear shaped, mandolin sized rebec, therefore, there is very little to go on. The making and playing of rebecs of all shapes and sizes have been revived through the early music movement although, to my limited knowledge, it has not attracted the attention of many players of Scottish traditional music. I wonder if there are complex revival forces operating here as Scottish musicians have tended to promote revivals that build on the more recent ‘golden age’ of the 18th century enlightenment and/or are committed to the generation and performance of what we call “new music in the tradition”. I suggest that questions and messages of national identity, image and future direction are at play here by which the connotations and sounds of the parallel revivals of the ‘very early music’ movement are rejected. Ethnomusologists love the idea of comparative study of living musical cultures and often prefer to look sideways rather than backwards for comparators. In Europe, but as far away from Scotland as we might go, it is possible to encounter instruments of the rebec type in everyday use. Might these give use some clues as to how such instruments might have been performed at one time in Scotland (if at all) and insights into our music in general? In Crete the bowed lyra is highly popular and enjoys a large, principally male (as far as I can detect) player community. The instrument is held almost vertically rather than under the chin and the strings are stopped not by pressing down on the finger board but by placing the finger nail against the string from the side.This allows for very precise intonation and the playing of a range of glissandi, vibrati and interesting ornamentation. In autumn 2014 in Rethymnon I visited the workshop featured in the video below where, sitting in the same chair as the musician shown, I was given a lesson on the instrument. I tried my best but could hardly get a sound from it! I was wholly unprepared for the idea of stopping the string from the side and became totally finger tied. But, as is always the case with music, things are not all they seem. The lyra is tuned as in the violin but it was not always that way. The instrument as made and played today is a modern version of an older instrument the lyraki that may have been associated in performance, musical style and repertory with a bagpipe tradition. Tunings were was different and there was much use of open strings and drones. The modern lyra subsequently developed under the influence of, and in competition with, the violin and was adapted to survive. In doing so, it and its music, became more violinistic. The violin became a dominant instrument is some parts of Crete, as in the province of Chaniá in the nineteenth century, while, until the second half of the twentieth century in Western Crete, the lyra was played mainly in the province of Rethymnon. After the Second World War the lyra became the subject of a major ‘official’ revival in which the violin, despite being long-absorbed into traditional music making, was shunned. Endorsed musical revivals, sometimes subtle, sometimes less so, are not rare. The lyra is certainly popular today among young musicians as well as old and we find, as elsewhere, the presence of new folk ensembles using ‘foreign’ instruments and sounds to make a new Cretan music. I recommend listening to the 2005 album Music of Crete by lyra player and revivalist Ross Daly that can be auditioned on Spotify. This, if I have it correct, could be a good basis for comparison with how the fiddle : violin polarity has played out in Scotland. There are historical recordings of the old ways of playing and a good album of Cretan fiddle music available on Spotify: Muisca populare di Creta- I Violinisti / Folk Music of Crete – The Fiddlers. For a case study of how the the lyra – violin tension affected one musician I recommend this excellent website Repertories and identities of a musician from Crete by Tullia Magrini. This image was published in Edinburgh around 1850 by G. Crawford, 6 South St. Andrew Street. It is from a drawing c1849 by Louis Ghemar and was clearly based on the Raeburn classic. Lithography was by Schenck & Ghemar of Edinburgh. It is understood that Louis Ghemar came to Edinburgh around 1845 at the invitation of the artistic lithographer Friedrich Schenck after they had met in Paris. I now know, as explored in previous tweets, is that there was a least one oil painting of Nathaniel Gow that was gifted to the Birnam Institute in 1929. There was also a painting, perhaps the same one, by John Syme that is said to have been untraced since 1837. A painting was also mentioned as being on display in Dundee at a musical event in 1872. What we do have is a lithograph, or a reproduction of a lithograph, that may or may not have been based upon the painting by Syme. Meanwhile, the Oxford Dictionary of National Biography has the drawing above, attributed to John Kay (1742-1826), as a likeness of Nathaniel. What do you think? Kay and Gow were certainly have been around Edinburgh at the same time and I like to imagine that Kay, as a barber, might have prepared his tie wig on occasion, hence the attention to that detail in the drawing.